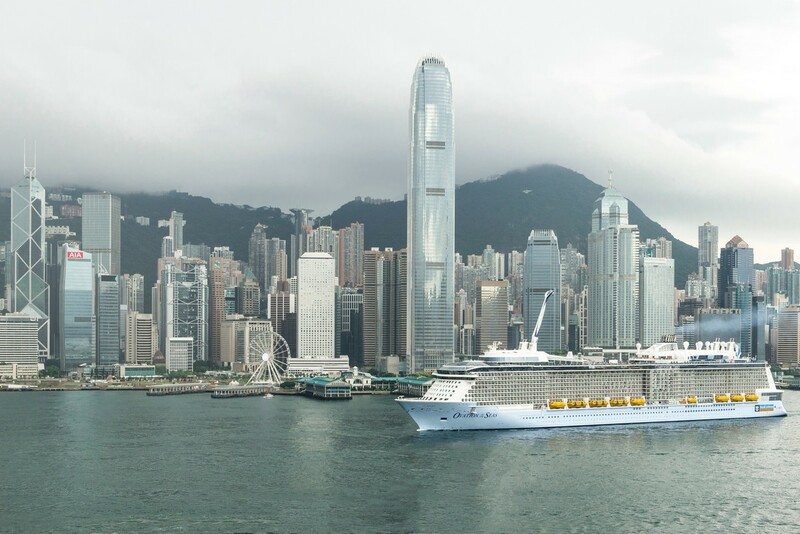 Royal Caribbean's newest Quantum-class cruise ship, Ovation of the Seas, arrived in Hong Kong earlier today. 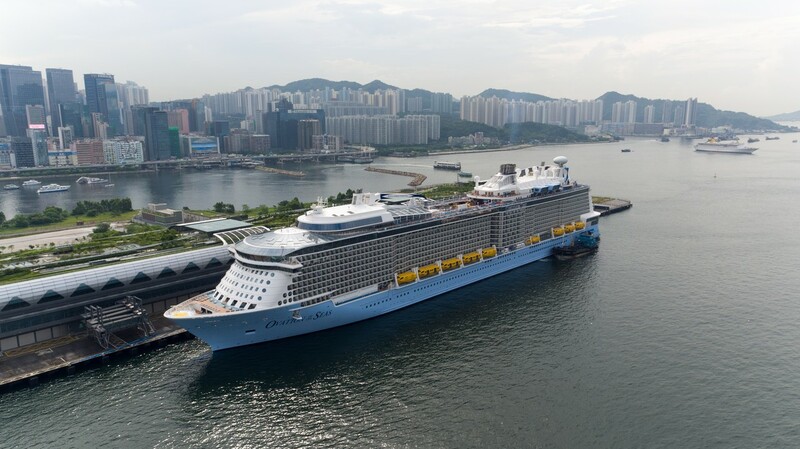 Ovation of the Seas is on a 53-night global odyssey cruise that began from Southampton, England and will eventually see her way to Tianjin, China on May 3rd. She will then have a season in Tianjin in June before coming to Hong Kong in November. 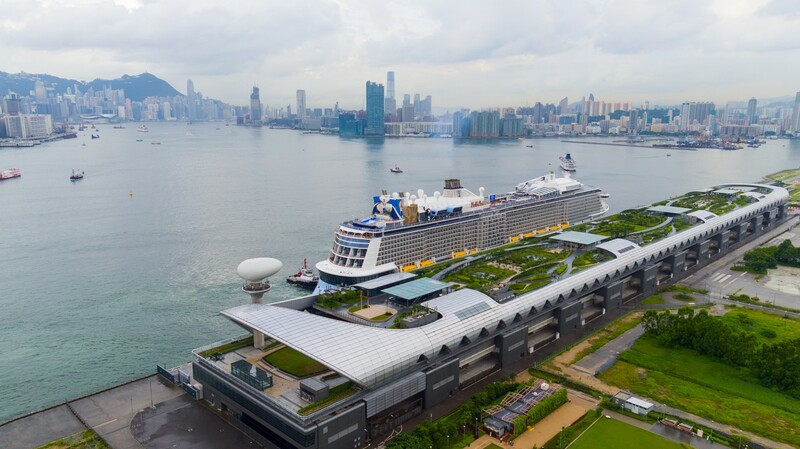 To enable Hong Kongers to get a first-hand glimpse of the massive ship, Royal Caribbean arranged for Ovation of the Seas to visit Hong Kong today and stay for one night en route her 52-day maiden voyage from Europe to Tianjin, China for a naming ceremony officiated by the first ever Chinese Godmother Fan Bing Bing. The Ship was officially delivered to Royal Caribbean on April 8th 2016. Photos copyright Royal Caribbean International. 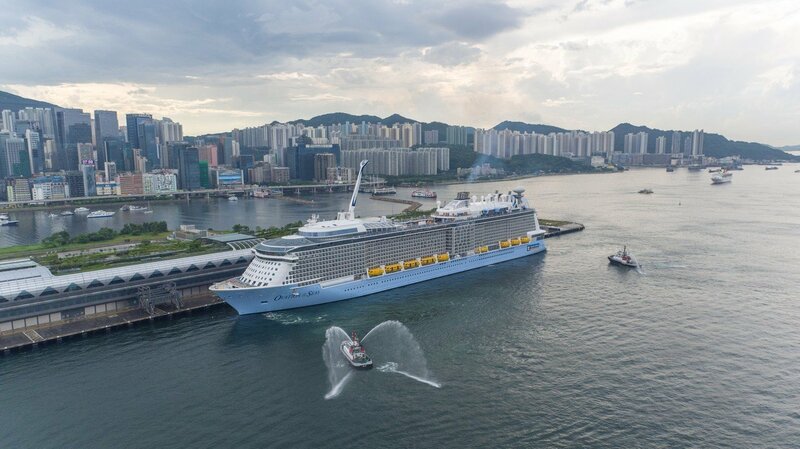 The grand entrance of Ovation of the Seas into Hong Kong was marked with a prestigious ceremony graced by senior government dignitaries and key industry stakeholders. These included the Honorable Gregory So Kam-leung, GBS, JP (Secretary for Commerce and Economic Development); Mr Philip Yung, JP, (Permanent Secretary for Commerce and Economic Development - Commerce Industry and Tourism); Miss Cathy Chu Man-ling, JP (Commissioner for Tourism); and Mr. Anthony Lau (Executive Director, Hong Kong Tourism Board). They were joined by executives from the cruise line including Mr. Michael Bayley (President and CEO of Royal Caribbean International) and Mr. Henrik Loy, Captain of the Ovation of the Seas. To mark the event, a themed ovation to Hong Kong was arranged in keeping with the vessel’s name to celebrate the occasion. 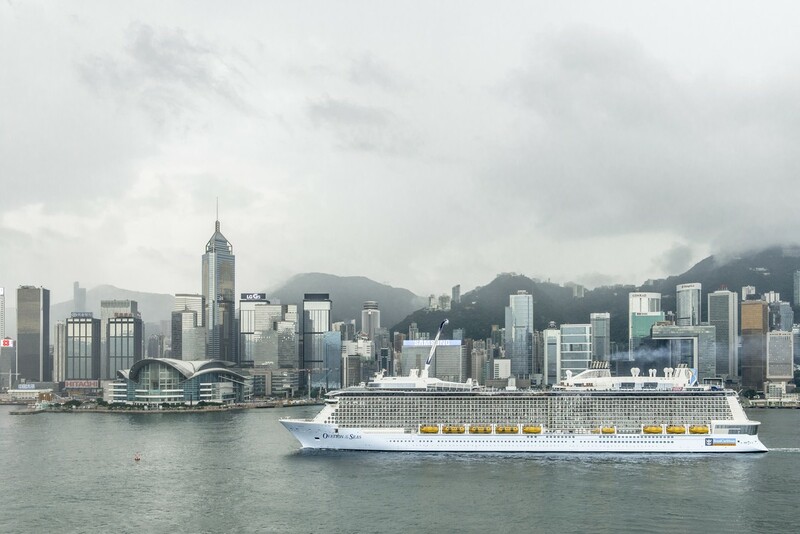 This “Cel-Ovation of the Marvels of Hong Kong” drew parallels between Hong Kong’s achievements and those of Ovation of the Seas in offering a world class “Cruise Extraordinary” experience to Hong Kong people. To this end, Royal Caribbean presented trophies to five Hong Kong celebrities who have achieved regional or global acclaim in the five areas. For Technology the trophy went to science whiz Chan Yik Hei, dubbed "Son of the Star"; for Art it went to music prodigy Wong Ka Jeng, for Culinary it went to the esteemed chef, Ricky Cheung; for Entertainment it went to dance producer Mak Chau Shing; and for Sports it went to speed climber Lisa Cheng, Hong Kong's very own ‘Spider Girl'.